Fearing for his safety and that of his family, Abraham cast his vote with the majority, thus voting for secession. To have not, he felt, would have brought immediate harm and violence upon him. Abraham always regretted this move, feeling shame for compromising his beliefs. Abraham kept a low profile during the first year of the war. At 50-years old, he was well beyond military age, but his three sons were eligible for service. The boys yearned to escape Virginia and join the Union army. The eldest son, Abraham, Jr., attempted to slip through the lines early in 1861 and made it as far as Centerville before being turned back. 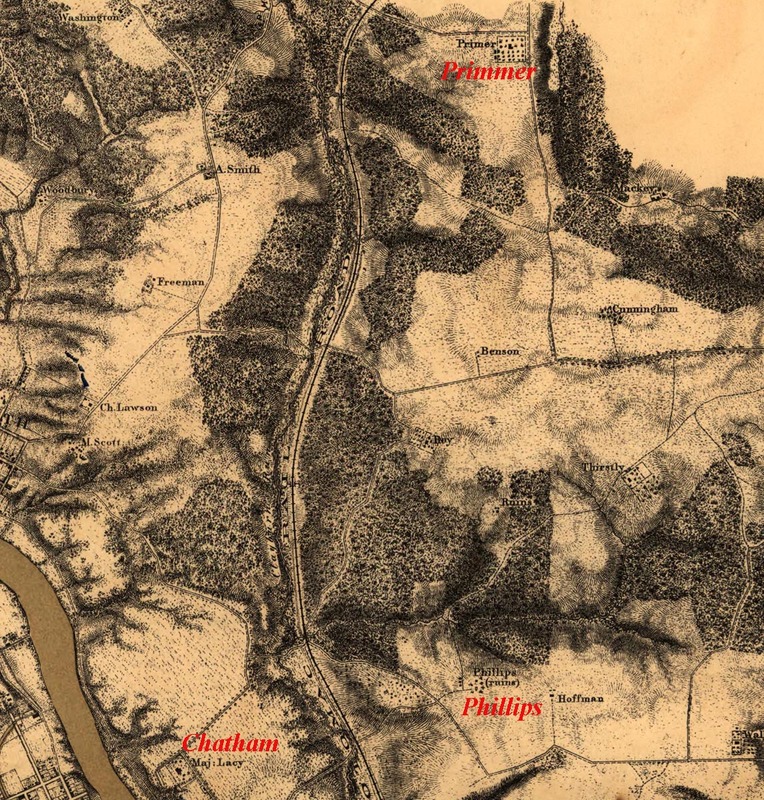 Abraham’s other two sons were able to reach safety when the Union army pushed farther into Virginia’s interior. DeWitt joined the 141st New York Infantry in August 1862, but died three months later of typhoid fever, before ever seeing a battlefield. Twenty-year old Judson joined the 177th New York Infantry and survived his nine-month enlistment, which included fighting in the Siege of Port Hudson, Louisiana. The grave of Abraham Primmer, Jr. near the site of “Bell-Air.” Unsuccessful in reaching the Union lines in 1861, he died at home of pneumonia on January 2, 1862. In addition to sending his sons north, Abraham also helped some of his fellow Unionists in the area to escape. For several weeks, John Bowman, a 41-year old native of Delaware and resident of Fredericksburg hid out at Bell-Air. Accompanying him was William L. Armstrong, also from Delaware, whose family farmed land in Spotsylvania and two years later hosted Ulysses S. Grant and his headquarters staff during the Battle of Spotsylvania Court House. Both men evaded conscription into the Confederate army and eventually made it safely to Union lines, thanks to the assistance provided by Abraham. The Union army arrived in Stafford in the summer of 1862. For many Unionists like Abraham, the sense of security provided by the army permitted a more open show of support. General George A. McCall’s division of Pennsylvania Reserves commandeered the fields and pasture of Bell-Air for use by its cattle. Abraham offered support to the occupying army by serving as a guide and providing information about the area. When the army fell back toward Washington in the late summer, he feared that his open support would most certainly make him a target with his neighbors and returning Confederate forces. Abraham left his family behind and sought refuge in Washington when the army left the Fredericksburg area that summer. Abraham returned to his family and farm when General Ambrose Burnside’s Army of the Potomac reoccupied Stafford County in November 1862. Bell-Air became a headquarters for the 3rd Army Corps under General George Stoneman. Following the December 1862 Battle of Fredericksburg, General David B. Birney occupied Bell-Air and his camps consumed the surrounding fields and woodlots. In honor of Major William L. Pitcher of the 4th Maine Infantry, who fell in the December battle, the encampment was named Camp Pitcher. When the Union army vacated Stafford in June 1863, Abraham once again vacated Bell-Air, taking his family with him this time, and relocated to their native state of New York. They did not return until the war was over. 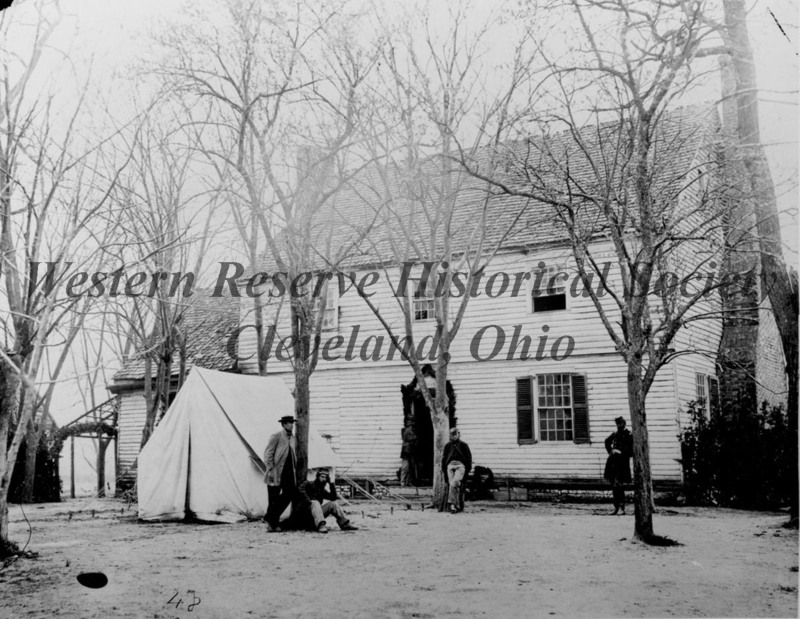 Bell-Air in use as a Union headquarters with the 3rd Army Corps – April 1863. 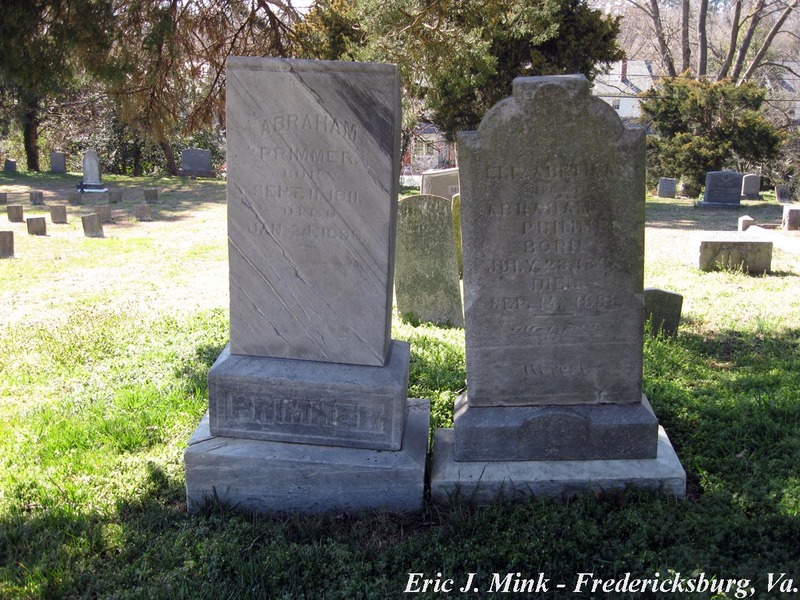 Graves of Abraham and Elizabeth Primmer – Fredericksburg City Cemetery. 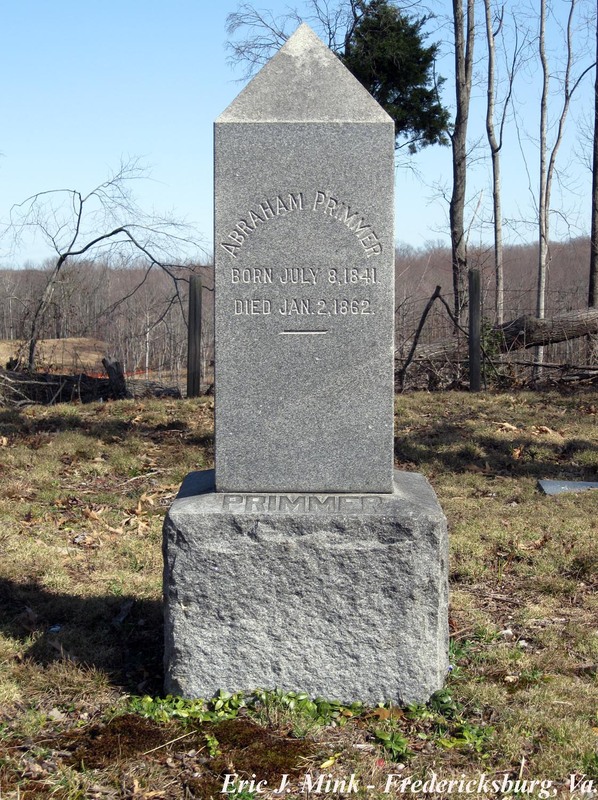 Abraham Primmer, Unionist and good citizen, rests in the Fredericksburg City Cemetery. To learn about thesite of Bell-Air today and how it and Abraham Primmer are remembered in his neighborhood, click here. Stonewall Jackson, JEB Stuart and Gen. Longstreet. Not thinking that they were in reality outlaws of the United States. Never thought about the persecution the unionist must have suffered through just. trying to live peacefully during those years of the Civil War. This is a whole new perspective to most people.